With the recent release of Solr 6.0, we got a host of new functionalities users have been anxiously waiting for. We’ve got the Parallel SQL over MapReduce that we recently blogged about, the new default similarity model, changes to the default similarity model configuration, the graph query and the cross-data center replication. We will slowly discuss all of the features of new Solr version, but today we will look at the cross-data center replication functionality, how it works, how to set it up and what to keep in mind when using it. The cross-data center replication uses a specialized transaction log. When using the standard replication in SolrCloud, Solr stores up to 100 entries in transaction log and uses that information to synchronize replicas with the leader. If the replicas are too far behind the leader (i.e., the transaction log is not enough to synchronize) then the full replication of the changed segments is performed. This is different from how cross-data center replication works. In cross-data center replication the modified version of the update log stores an unlimited number of entries and uses that information to synchronize the source collection which we index data to, with the target collection that works as a copy of the source. The idea behind the logic is that the so called replicator configured in the source collection periodically reads the data from the update log and sends the updates in batches to target collection(s). This is the basic data flow when using the cross-data center replication. Keep in mind that the operations in points 1 – 5 are synchronous and the ones in 6 – 9 are done asynchronously by using a separate background thread. This is done to enable batching and optimize the way updates are sent through the network to ensure maximum scalability. For the purpose of the this post, we decided to set up a cross-data center replication between two data centers. The source one, to which we will index data is called East and the target one which will receive data using replication is called West. Each data center will have a single SolrCloud cluster with dedicated ZooKeeper ensemble, so that each cluster is not dependent on the other. The second section provides the configuration for the replicator functionality. This functionality is responsible for monitoring cross-data center replication update log (every schedule milliseconds), create batches (with batchSize number of entries) and send them. It is suggested to use one thread per replica (controlled by threadPoolSize property). The third section of the /cdcr handler configuration is the update log synchronizer, which is configured by a single schedule (specified in milliseconds) property. This configuration section controls how often non-leader nodes need to synchronize their update log entries with their leaders to clean up the entries that should be removed. Keep in mind that the only required part of the /cdcr handler configuration is the replicator part with its configuration properties. All the rest of the /cdcr handler configuration can be omitted. Finally, we have the modification of the default updateHandler section. What we need to do is configure the updateLog entry with the class=”solr.CdcrUpdateLog” section. This is crucial, because the default update log configuration stores 100 entries, because this is what is needed to synchronize replicas in SolrCloud. In cross-data center replication situation we need an infinite update log and because of that we need to change the implementation. modify the updateHandler in the same way as in the source collection. First we have the /cdcr handler configuration. It is very simple – we just need to disable the buffering functionality. We do that because we only need to buffer update log entries infinitely on the source collection, not on the target ones. That’s why we include the above configuration. We also need to provide a modified update request processor chain that includes the solr.CdcrUpdateProcessorFactory processor before the solr.RunUpdateProcessorFactory. This is needed for cross-data center replication to work on the target collection. We called our modified update request processor chain cdcr-proc-chain. We include that chain in our /update handler configuration using the defaults section and the update.chain property. Finally, the same modification needs to be done to the default updateHandler section. The modification is exactly the same as the one in the source collection, so let’s not go over that for the second time. Let’s see how to start the cross-data center replication when you have empty collections, ones that you are just about to create. This is simpler than starting the cross-data center replication when you already have data. That’s because the replication mechanism relies on information stored in the update log and it won’t replicate the whole collections automatically by doing binary segments copy, just like the standard replication. After doing the above, the replication should be setup and working, so we can start indexing the data. After doing the above, the replication should be set up and working and we can enable indexing again. As you can see, the operation requires more manual work and this is one of the issues when setting up cross-data center replication in existing SolrCloud clusters at the moment. The good thing is that we only need to do this once and we are good. "text_ws" : "First test document"
"text_ws" : "Second test document"
Keep in mind that we don’t have any automatic commits specified in the solrconfig.xml file (neither soft or hard), so we need to take care of the commits ourselves as we did in the above command. When the update command is received by the leader shard in the source collection it is processed, indexed and written to the update log. Then, the replicator sends the data to the appropriate leader in the target collection and again it is processed and indexed. This is done for all the leaders in the source collection (in our case we had just one). Last but not least, there are limitations to the cross-data center replication feature in SolrCloud. First of all, the current state of the cross-data center replication uses an active – passive approach. This basically means that there is only one source collection and it can’t be changed dynamically. So when our source collection fails or the data center in which the source collection is hosted is not available, we won’t be able to index data. Of course, we will still be able to search through the data, so no issues there. Keep in mind there there is work planned to overcome this limitation in the future releases of Solr 6.x, so something to look for if you are interested in cross-data center replication. The second limitation is related to the connectivity between data centers. When having a large number of indexing operations we are limited by bandwidth between data centers. If we index enough data to exhaust the network, our target data centers and collections in them will fall behind. This is a physical limitation and something we have to deal with, because we need to transfer the data one way or another. Finally, the last thing about the cross-data center replication is that similarly to the standard replication handler, the cross-data center replication handler supports an API that we can divide into two categories – control and monitoring. 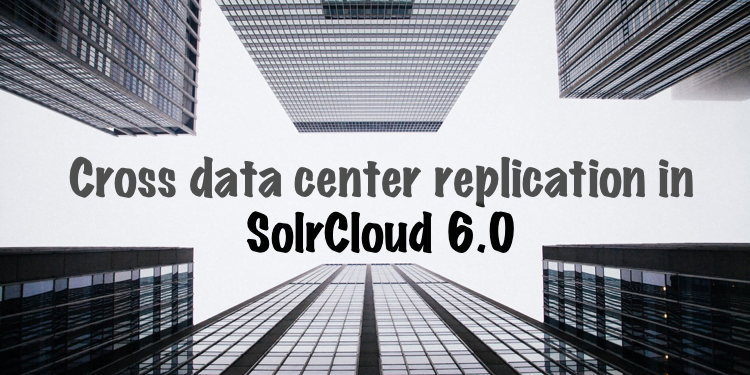 As you can see, with the release of Solr 6 we’ve got a viable solution to cross-data center replication when using SolrCloud. Of course, it has its limitations and we need to be aware of them, designing our software with them in mind. The good thing is that we now have the ability to have the data available in multiple data centers at near real time and can avoid being negatively impacted by issues affecting even the whole data center. Thanks for the article, i was able to set up CDCR between source and target DC’s. Now my question is how to add a 2nd target DC. Which method should I try, please suggest? Hello, great to hear that that you’ve managed to setup CDCR. For multiple clusters I would go for adding multiple replica sections in the source collection configuration. From the code, I can see that Solr is capable of reading a list of replicas, so that should work. Try adding multiple replica sections and that should work. I have the same issue as it is not replicating. Hi, do you see anything in the logs? 2016-06-21 06:48:51.335 WARN (cdcr-replicator-279-thread-1-processing-n:10.81.150.63:8983_solr) [ ] o.a.s.h.CdcrReplicator Log reader for target sitecore_core_index is not initialised, it will be ignored. @NIHKI did you check your Solr logs? Anything informative in them? I’m testing Solr 6 CDCR, but when i follow your tutorial it’s seems not working. The documents are not replicated to the target zone.